It’s been a while since I looked at the stats for where deals are coming from. And let’s face it – most come from relationships of some kind. Former clients, referrals, other agents and so on. But I was really interested in seeing how online sources were doing. For this brokerage, the numbers weren’t that impressive. Overall, aggregator and social sites contribute only about 5% with the percentage fluctuating 2% either way in individual years. I decided to see if there was a difference in online source contribution in the offices that had Premium LoopNet memberships. The data showed that in those offices, online sources were contributing up to 4 times more than the company average. In one office that recently signed up, you can even see a jump in deals from LoopNet beginning in the year they switched. I want to point out that the offices with Premium Memberships tend to be in very small or fractured markets so they see LoopNet as pretty much the only way to promote their listings. And it seems to be a correct assumption. Even in the larger markets, those agents that do have Premium Memberships have higher rates of closed deals sourced from LoopNet. So a Premium Membership is looking pretty good, huh? Well, that depends on whether the deal revenue covers the cost of the membership. And…the numbers show that for most years, it does. Within offices, there are some agents who benefit more than others. Could be they have “better” listings or they’re just better agents. So it seems that converting whatever you get from LoopNet varies on listing quality and agent skill. Sign calls are fairly steady continuing to attract buyers/tenants and contributing to about 7% of revenue. 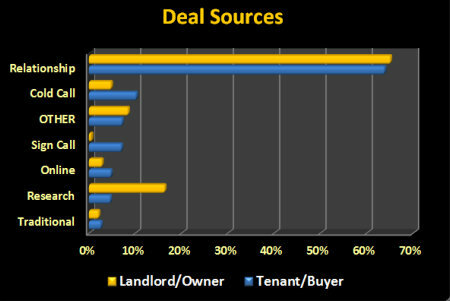 Cold calling still pays off for both acquiring tenants/buyers (nearly 10%) and finding owners (5%) to list. Email blasts (included in the Traditional category) have ticked up a bit but don’t contribute that much overall (under 3%). A few years ago, the category “Research” was added. Meant to cover “discovered” opportunities (drive-bys, database searches and the like) it’s proved to be a good way to find owners. And a caveat about the data. It’s self-reported by agents at the time they obtain a letter of intent or escrow deposit. Since there can be quite a bit of time between inception and those points, agents can forget where the lead actually came from. In fact, one agent told me he got lots of leads from LoopNet that turned into deals but he rarely selected LoopNet as the source. Instead, he chose a relationship category. To him, no matter where the lead came from, it was his relationship building skill that made the deal happen. On one hand, I wanted to slap him. On the other hand, it was nice to know that agents see their clients as people and not as leads. « Should Agents Do Their Own Marketing?